Over the past couple of years I've been helping Hitchin Historical Society put together audio visual presentations. 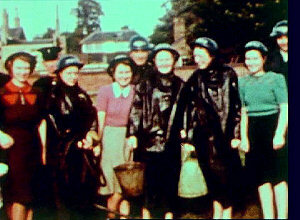 These are based on images supplied by Hitchin Museum and various home movies donated to the Society. 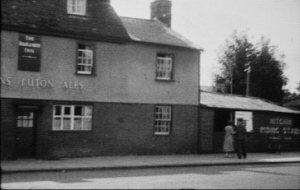 The project has been led by Historical Society film archivist, Richard Whitmore, and I have been partnered by Tim Ray of Hitchin Films in editing and preparing the material for exhibition. The images at the top and above right come from a film made by members of the Hitchin Youth Centre intended to be sent to a similar club in Australia who were pen-pals of the Hitchin one. Unfortunately for them , but fortunately for us, the Australians disbanded their group after a disastrous fire destroyed their premises. 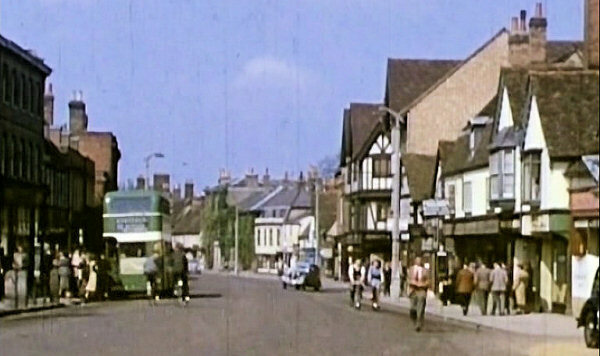 As a result the film stayed in Hitchin and has been transferred to video from the 16mm original. As I write in 2011, it's the centenary of the coronation of George V. Hitchin celebrated by decorating the town centre and with a parade as shown in this picture from the local newspaper, courtesy of Hitchin Museum. 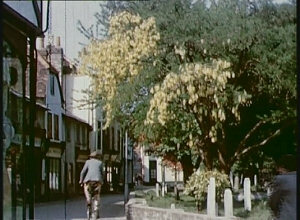 A cinema film was made by local man, Ernie Blake, of the occasion and he can be seen to the left of the picture with his tripod and camera. The film lay forgotten and gathering dust in the Regal Cinema in Bancroft. It was rescued by the grandson of the builder of two of Hitchin's cinemas, John Ray, and passed to Richard Whitmore. 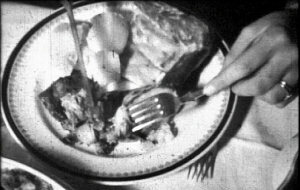 Mercifully the nitrate stock of the film had neither caught fire nor deteriorated beyond use. It has since been dispatched to the safe keeping of the British Film Institute. They will repair it and transfer it safely to DVD. 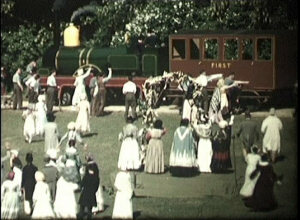 Extracts were shown during the 2011 Hitchin Festival and are included on the Historical Society's DVD. 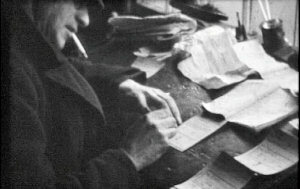 During World War II the townsfolk were busy raising funds for the war effort. Above is model ship called HMS Hitchin afloat on the River Hiz in the Priory grounds during Warships Week. The cash went to support a real battleship, HMS Norman. Staggering amounts of money were raised at these events which would add up to millions in today's money. As well as fundraising there was much training to be done. 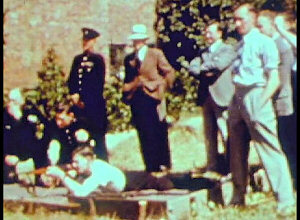 On the left women civilians are learning how to extinguish fires caused by incendiary bombs, whilst to the right police held shooting competitions to improve their marksmanship. 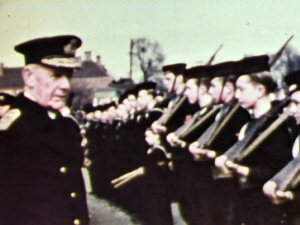 Landlocked Hitchin had no need of a Sea Cadet corps, but when Eastbourne Grammar School boys were evacuated here they insisted on forming their own group. Admiral Sir Lionel Halsey inspected them in this parade in St Mary's Square seen on the left. 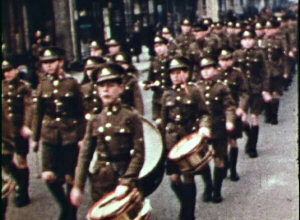 The Eastborne boys also brought their Cadet Corps pictured on the right marching in another fund-raising day parade. 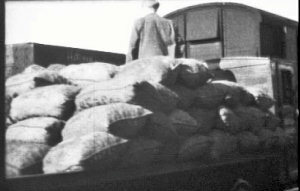 The wartime films were supplied by the East Anglian Film Archive. 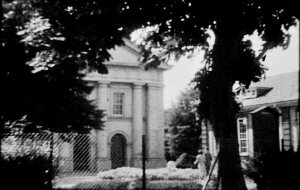 Along with still images from Hitchin Museum, Eastbourne Old Grammarians and various other private collections they formed the basis of Images of Wartime Hitchin shown during the Hitchin Festival in 2010. 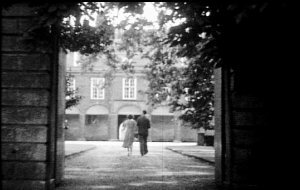 The first film made by the the short-lived Hitchin Ciné Society. 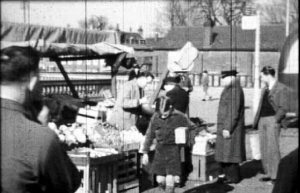 A quaint choice of subject, recording the journey of the humble Brussel sprout from a field near Charlton to the dinner table via Hitchin Railway Station and the market on St Mary's Square. 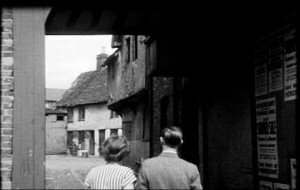 Views of a vanished way of life as well as the way the town looked in the 40s. 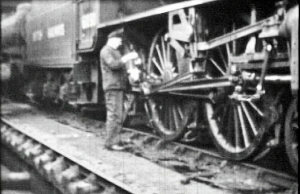 Such access to the railway by amateur film makers would be unthinkable in today's culture. 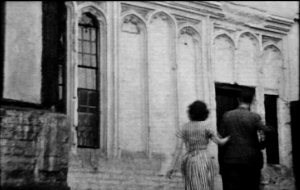 The Cine Society produced this feature about the history of the street based on a lecture given by local historian, Reginald Hine. 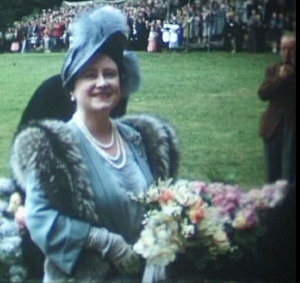 The commentary was originally read out during the showing of the film, but Richard Whitmore has written a skillful commentary incorporating much of the lecture with a description of the making of the film. Two actors from the Society are cast as visitors exploring the town and they take us on a tour of the town. 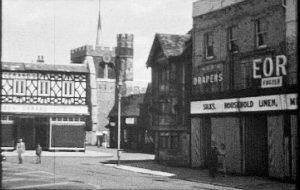 After a walk down Windmill Hill they enter the Market Place (1) and move on into Bridge Street (2). We are taken to the Priory (3) at a time when it was still occupied by the Delmé-Radcliffes. After showing us some of their treasures a walk through the grounds brings us back into Tilehouse to see some of the premises. 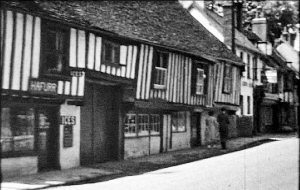 We see the back of the former public house, The Three Tuns (4), and hear it's story. 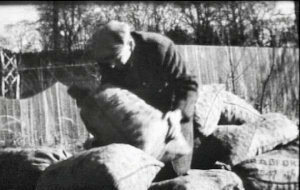 A visit to the last surviving basket weaver takes us onto Halls Yard (5). Some recently discovered secrets of the Cooper's Arms are shown (6). 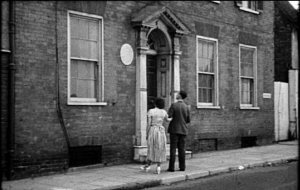 A look at former home of poet and playwright, George Chapman, (7) takes us on into what is now Upper Tilehouse Street. Tilehouse Street Baptist Church (8) was not well served by the chain link fence at the front - thankfully now replaced. The tour finishes at the Highlander (9) and the adjacent riding stables - now the pub car park. Another anniversary in 2011 is the 60th for the Festival of Britain. 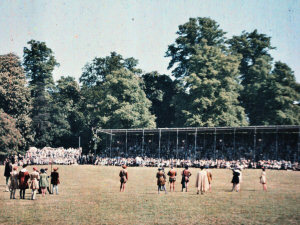 1951 saw a programme of events throughout the summer with the highlight being a full scale pageant with a cast of hundreds raised from the town and surrounding villages. The event was graced by the presence of Her Majesty Queen Elizabeth for the opening performance. 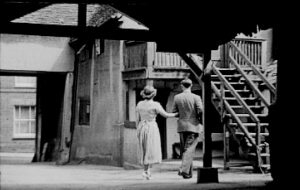 Devised by seasoned Pageant Master, Cyril Swinson, it told the story of Hitchin from its founding by King offa in 792 up to the present day. 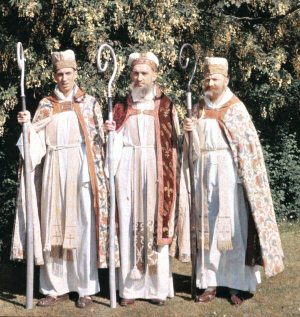 The image on the right of the bishops at King Offa's founding is from a set of Dufaycolor slides in the possession of Hitchin Historical Society. 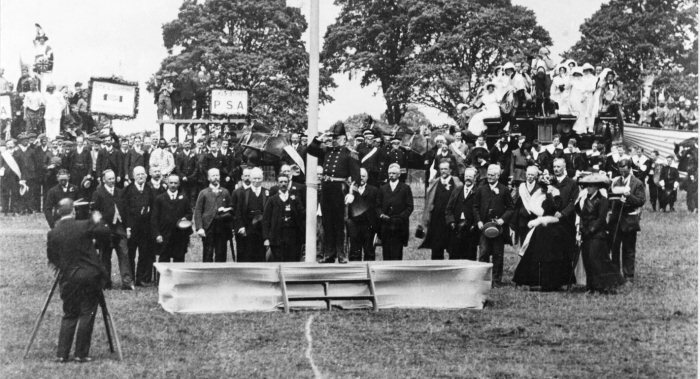 The action all took place in front of a long stand erected in the grounds of the Priory. In the 19th Century the railway arrived in Hitchin as depicted by this magnificent wooden mock up of a steam train.